Well this week is an interesting assignment over at the cooking club and a bit of something new for dinner was in order so in keeping with the theme “From the West” or really anywhere else you fancy I chose “somewhere else” a Spanish omelet recipe for an easy weeknight dinner…Eric’s recipe involves stove top cooking and then finishes in the oven my goal was to use just the stove top so I actually made Jamie Oliver’s stove top method, but you can take a look at both recipes and choose what suits you. I haven’t made any sort of real dinner omelet in quite some time and it just seemed to fit the bill for an easy tasty dinner on the porch. A simple salad (Eric’s little gem lettuce with warm garlic dressing), some good cheese and call it dinner. A Spanish omelet most of the time is just a simple dish made with potatoes and eggs along with a few ingredient options such as onions, garlic and in this case a wonderful perky seasoned olive oil for a hint of spiciness…a great accompaniment to a tapas style dinner for a casual gathering. 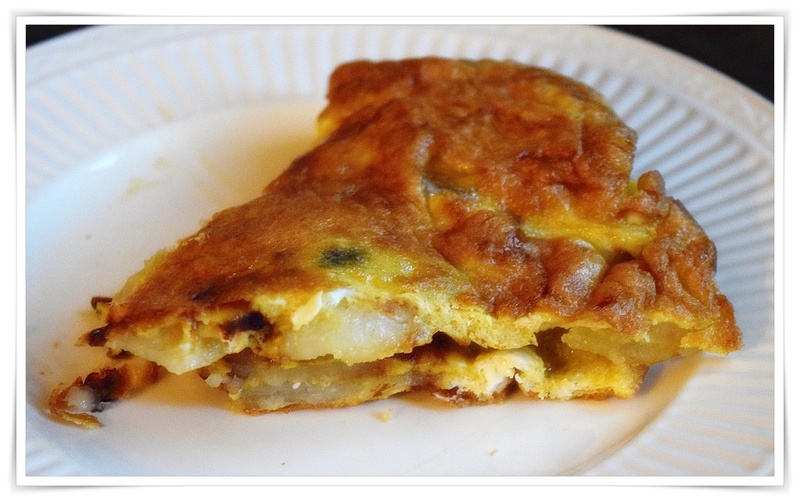 Jamie suggests chorizo as an added ingredient, but I guess that one can add whatever they like to omelet. There is also a video with Omar Allimboy showing how to make the stove top version.